When I first met Jen Healy I was only interested in the therapeutics – I felt my daring days were done and did not think i was up to some of the acrobatics. 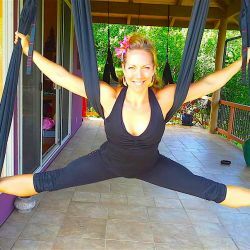 Fortunately I stayed with her and took her teacher training, where I slowly realized that even the flips and tricks, when supported by the swings, were still potentially nurturing and healing and quite attainable! I’ve had a love affair with yoga asana since 1992. I experienced a joyous rhythm of breath, body and spirit that truly felt like I had fully arrived in the human temple of being alive. But as I approached menopause, I began to lose the ease and fluidity that I had taken for granted, and began to enjoy my practice less and less. 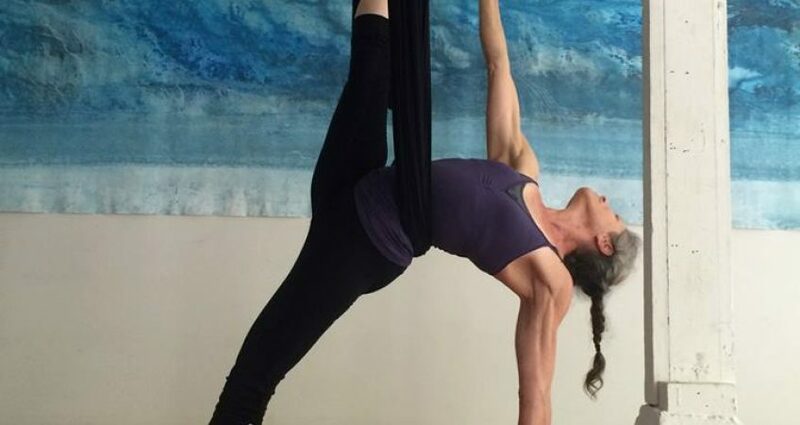 Backbends were no longer blissful, tendonitis from aggressively pursuing arm balances and too many chaturangas,Then I took an Aerial Yoga Play class and in one hour, I felt a revival of ease and a release of stagnation that something like receiving the most divine and magnificent session of bodywork I had ever experienced. And by the way, I have had the privilege of working with several of the most gifted hands on the planet.Most days, whether I am nursing an injury, a flu or just plain tired, the swings offer such ease, comfort and tactile sweetness that even just 5-10 minutes helps to shift me to a far happier place.The work on the swings is powerful, and yet safe for almost Every Body. Some Bodies take to the swings immediately like little swans on a lake, and some Bodies experience strong shifts and detox reactions to the deep work that occurs. I promise that if you can stick with it, progress as slowly or quickly as necessary, you will be rewarded with the power of a healing technology which will leave you hanging!!! !